This year we have seen several nights that have endured freezing temperatures in various parts of the valley. 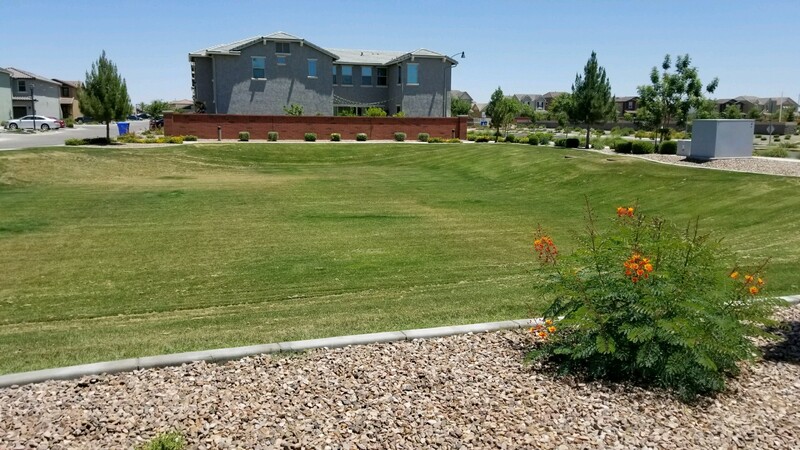 Many communities that have been affected show brown and yellow plants throughout the property, giving the landscape a less than desirable appearance. Before bringing in your landscaping crews to start trimming back the dead branches, hold off as the frost season is still upon us. Resist the urge to prune the dead, brown parts of your plants until the frost season is over. While even though the appearance of your plants is unsightly, unless the plant is completely dead it will need those brown parts for continued insulation before it begins to sprout again in the spring. Drape sheets, blankets, or towels over your frost susceptible plants when nights are expected to be in the lower temperatures. Be sure to hang the sheet so that it covers the whole plant all the way to the ground, without tying it to the base. The loose blanket will help to trap the heat all the way around the plant and give it a stronger chance of survival while maintaining the greenness of the plant longer. Don’t stop watering. While this may seem like an odd statement, it is, in fact, healthier for the plant to receive continued watering during the frost season. Frost damage occurs when the ice crystals formed on the leaves of the plant dry out causing dehydration. Damage from this dehydration will be less severe if the plant is not already drought-stressed. Try to keep everything evenly hydrated, without over-watering, as that can be even more harmful depending on the plant species. Optimal pruning methods recommend waiting until new sprouts on the plant have become visible and the threat of frost season has passed. Only prune your community’s plants and trees after new growth has begun. 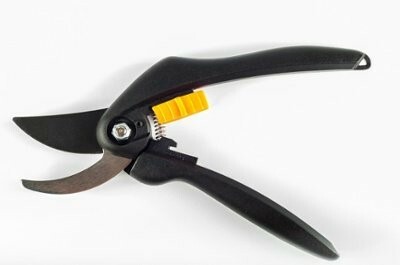 This way you are better able to see where to cut your limbs so as not to remove healthy, stimulated branches. 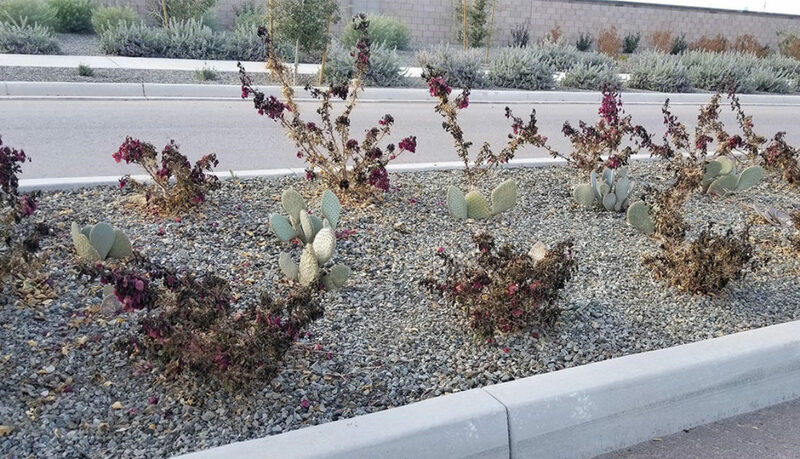 Some of the plants on your property including lantanas, ruellias, baha ruellias, oleanders, orange jubilee, bougainvillea, and yellow dots are all prone to frost damage, among others, and will be not be pruned until mid-February or at the last chance of frost. 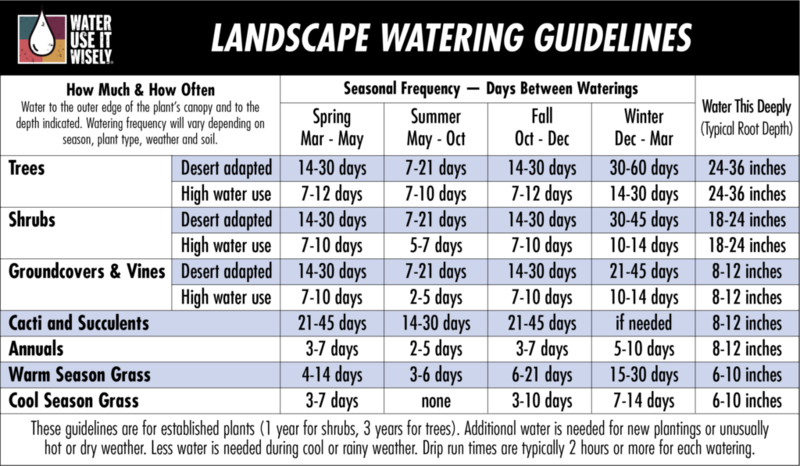 The University of Arizona has provided a more extensive version of Frost Protection methods that is worth referencing as a guide during this season and can be found HERE. This year’s monsoons have devastated the valley with harsh winds and copious rains. 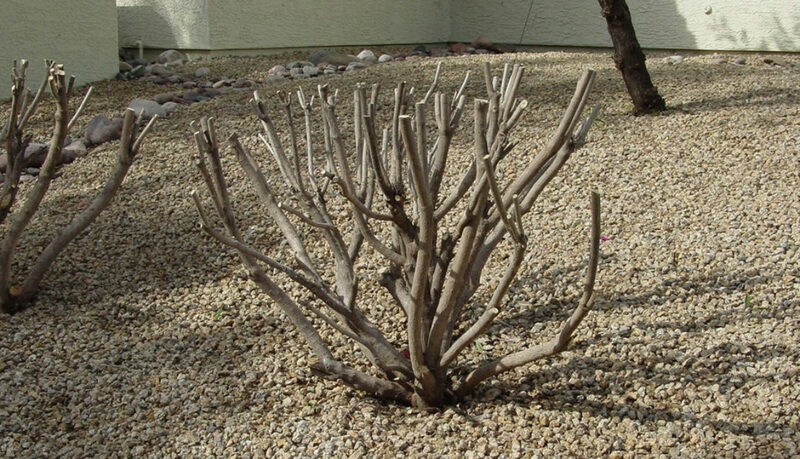 Due to the excessive heat this summer and the 100 plus days with no recordable moisture this year, the desert trees fall dormant and stress, which causes their root structures to stretch to the surface to receive as much hydration as possible. All too often we come across a community who experiences severe storm damage this time of year and didn’t properly prepare or have a plan in place for restoration. This is where budget planning comes into play. While monsoon season can be predictable as in the time of year it occurs, the strength of its storms cannot. We recently came across a property that lost over 500 trees in the past couple of storms. Yes, I said 500!! Protect your community’s largest asset by putting a strong emergency storm damage plan in place. Queue BUDGET SEASON! Now is the time to start the discussions for forecasting potential disaster clean-up, replacement options for plant and tree material, property enhancements, etc. Speak with your landscape professional to discuss potential worse case scenario situations and start investing. So how do I prepare? Here is a list of suggestions to help ensure your community is financially prepared for potential monsoon disasters. Start with your landscape professional. 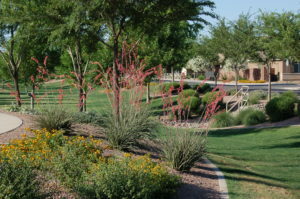 Landscaping on a property is one of the community’s largest assets and therefore needs to be protected. Speak with your landscape professional about ways to work potential storm damage into the yearly budget and help calculate a suggested reserves deposit. Speak with your Arbor team. Trees down are one of the most common visuals we see when the storms hit. 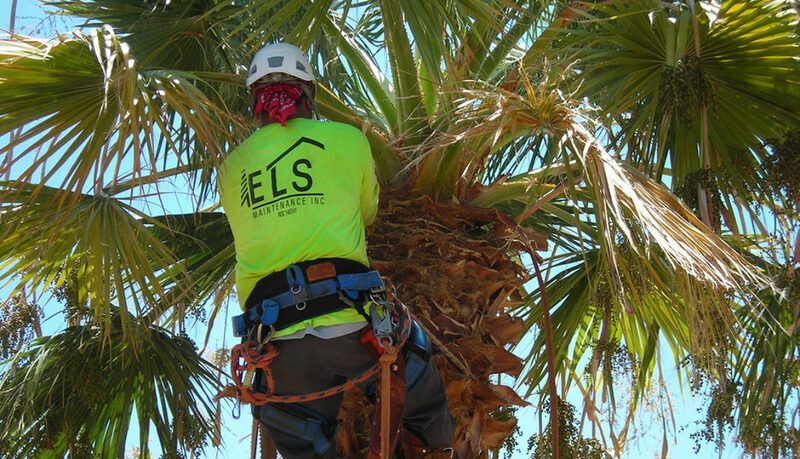 So many factors can go into weak trees that are more susceptible to falling including, improper pruning, pest infestations in the tree and/or root structure, imbalanced chemicals in the soil, etc. 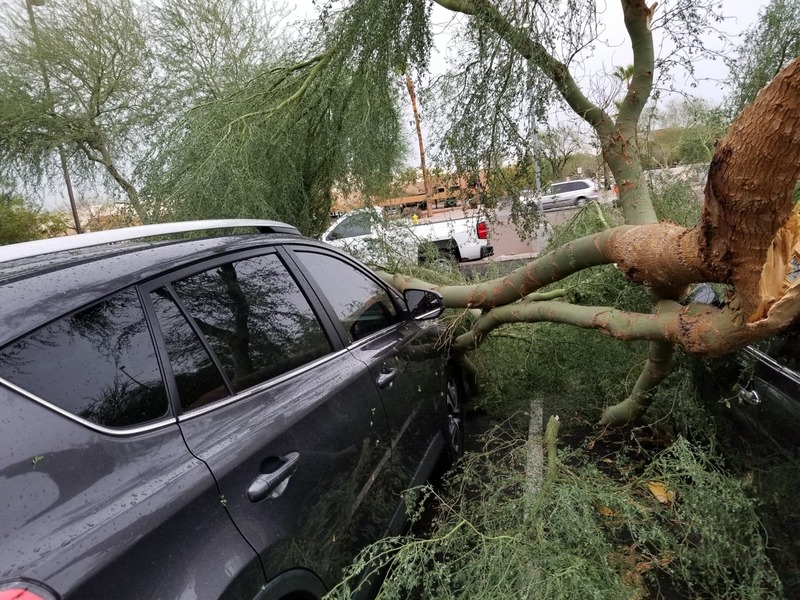 By properly pruning your trees at the recommended time of year, and not just before the storms hit, will allow the tree to re-establish its weight and ground itself prior to the monsoons. It is also a critical practice to pull back drip irrigation away from the trunk of the tree as it grows to improve root growth and deter “balling”. Speak with your Enhancements team. 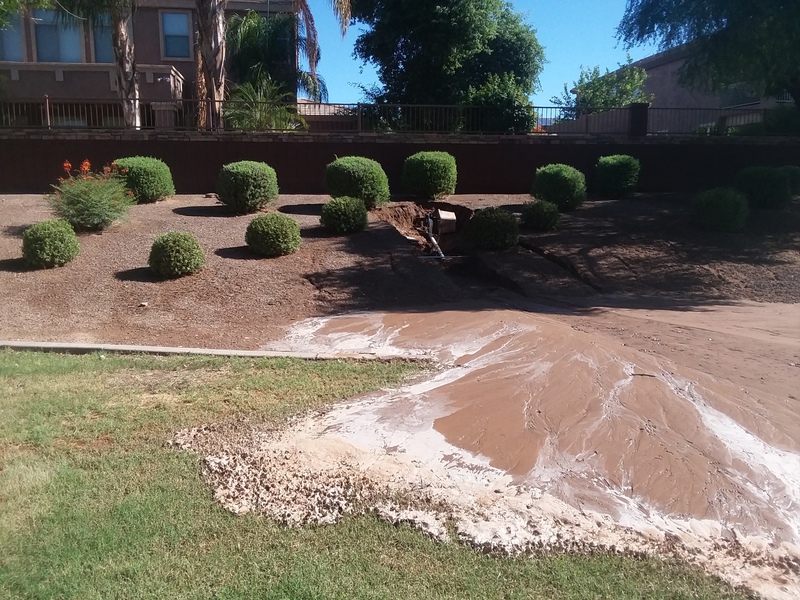 Another common result of monsoon storms is erosion issues. Make sure to have a plan in place, and budgeted funds set aside, for erosion issues to be repaired and the granite replenished. Other options could also be set in place to help prevent erosion from being so severe and give you a more proactive approach to maintaining your community versus reactive. It can be challenging at times to try to forecast a community’s needs for the next year, but by speaking with the professionals, they can help guide you to make the most educated decisions for your community’s future. 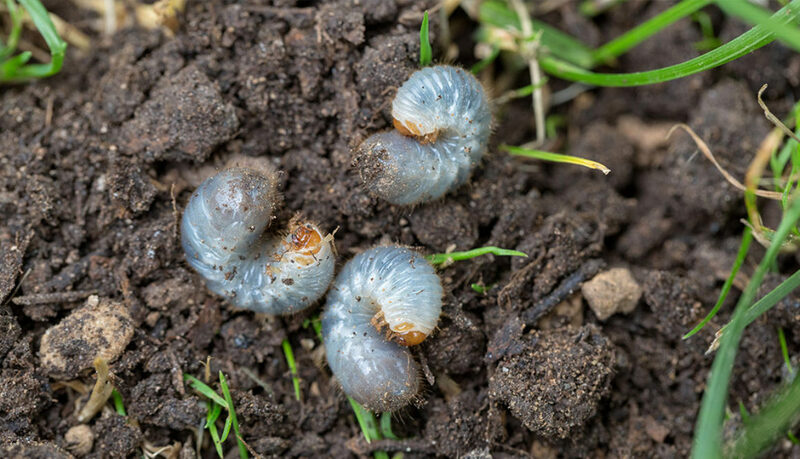 White grubs are making their presence in lawns across the valley causing gradual thinning and weakening of turf-grass. White grubs are the larval stage of scarab beetles (aka June beetles, dung beetles, and masked chafers). 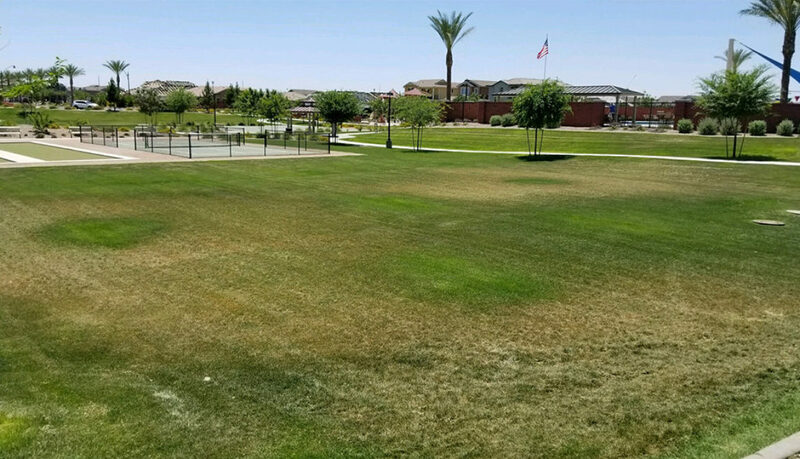 Arizona has many different species of scarab beetles and most of which do not cause any damage, however, there are several species that can wreak havoc on turf-grass areas and other cultivated plants. The white grub larvas start off by feeding on the turf-grass roots causing a weakening of the strand and gradual thinning. The damage may start off in small patches, gradually turning into much larger areas, even with adequate soil moisture. 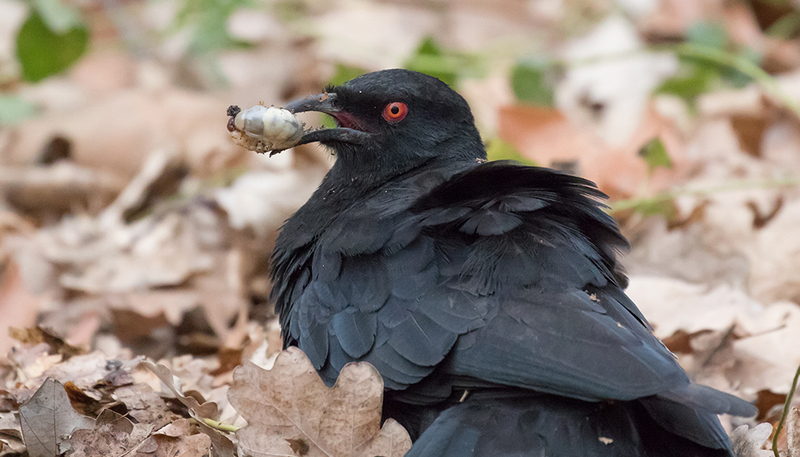 These grubs also attract larger animals such as birds, raccoons, and other small mammals who hunt for these insects as a source of food. These small mammals can also propose more unwarranted damage to the turf areas in your communities and lawn. However, even though these pests can propose a problem in communities around the valley, it can be treated! There are different sources of insecticides that can treat the affected areas, reducing the amount of damage these grubs can cause. If you are seeing thinning areas in your turf, contact your landscape professional to see what options you have for treatment. 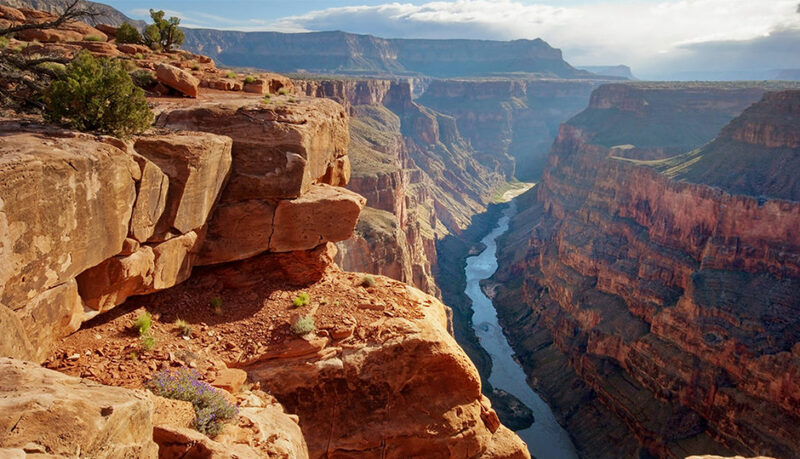 One of our country’s most famous landmarks was formed from consistent water erosion – The Grand Canyon. Although this type of soil erosion has created one of the most spectacular American landforms, when it comes to our backyards or community common areas, there’s a different story. Water erosion in our communities can become not only an eyesore but also very costly and hazardous to homeowner safety. Soil erosion happens when heavy rains hit the overly saturated ground, loosening the soil underneath and washing it across the ground. 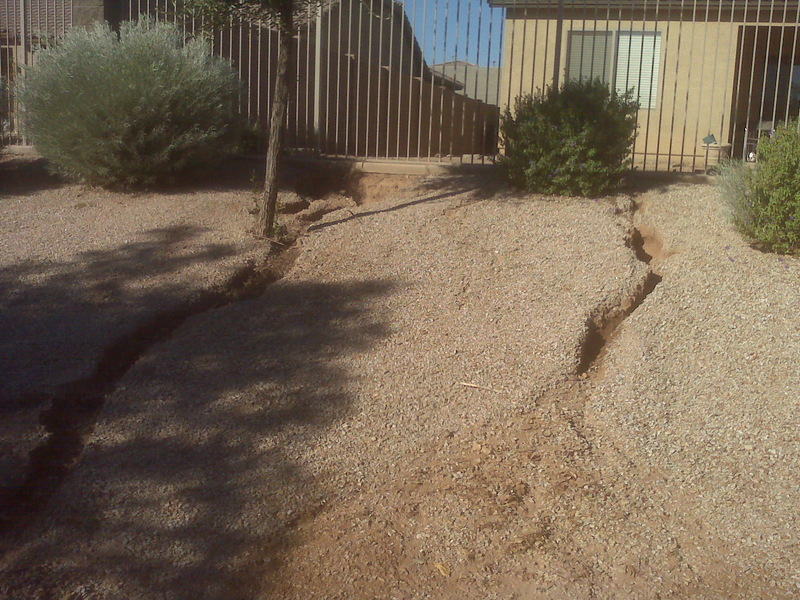 Faulty irrigation systems or mainline water breaks can also cause erosion issues. This type of runoff can carry fertilizers, nutrients, and other types of pollutants with it, presenting a hazard of harming wildlife who drink from the larger bodies of water. Not only does erosion carry the soil where it shouldn’t be, it also proposes tripping hazards, clogged dry wells, and nutrient degradation. Monsoon season brings not only destructive winds and dust storms but also heavy rains which can cause erosion in our dry desert landscape. Talk with your professional landscape management company to discuss any preventative measures your community can make to reduce the risks that go along with soil erosion. Now that the temperatures have consistently been above 65 degrees in the evenings, it is time to start phasing out the Winter Ryegrass in your community and re-vitalizing your Bermudagrass. 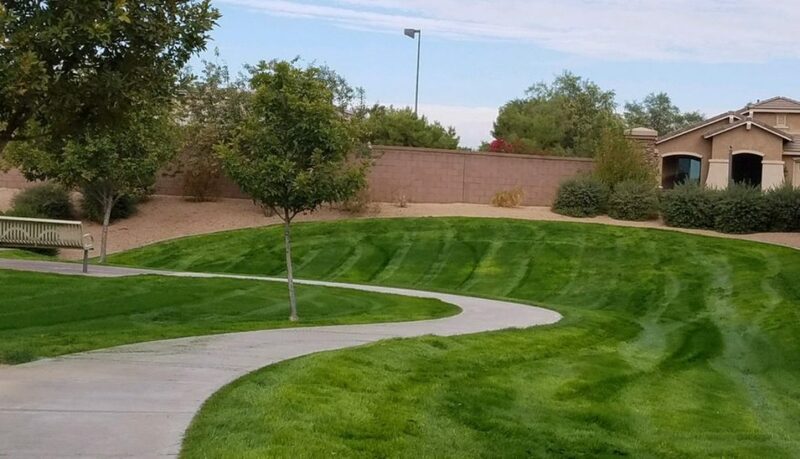 Here in the Arizona desert, our climate calls for two different grass species; Bermudagrass in the summer and Ryegrass in the winter (should you choose to overseed). This time of year the Ryegrass starts to wilt and turn brown as it dies off for the summer and the Bermudagrass begins to sprout. There are several tips to consider when transitioning your turf so that the Bermuda will begin to emerge. Scalp you winter rye to about 1/2 its usual length, allowing the heat from the sun to get through and stress it into submission. 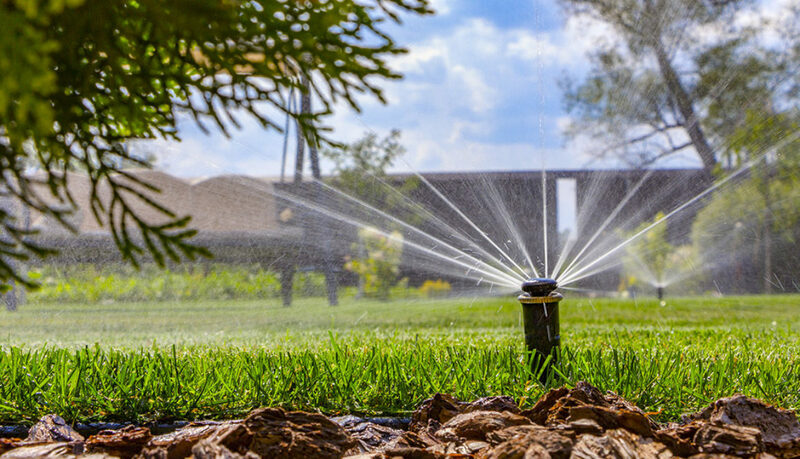 Decrease your water usage to allow the Rye to die off. Bermudagrass thrives with less water and warmer temperatures, whereas Rye requires the exact opposite. Fertilize your turf using a high ammonium sulfate fertilizer to weaken the Rye’s hold while strengthening the Bermuda’s control. 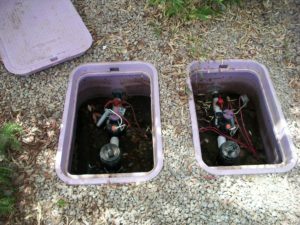 It may also be a good practice to aerate your lawn to allow water, oxygen and the fertilizer to better reach the roots of your grass. This transitional time of year may be confusing to those not familiar with our desert climate. That is why it is important to understand the anatomy of our native Bermudagrass and its transitional behaviors/requirements. As our trees start coming out of winter dormancy, landscaping crews are gearing up for spring tree trimming season. 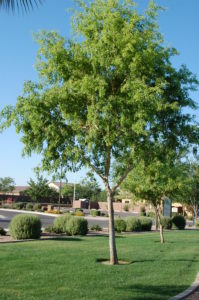 During this time of year, it is a best practice to start reducing the tree canopies to help prevent storm breakage during the summer monsoons in July and August. By alleviating some of the end weight on heavy branches, it allows the strong winds to flow freely through the branches, reducing the strain on the trunk. The summer monsoons can propose a lot of danger with fast winds and excessive amounts of moisture in the air. Heavy rains can cause an oversaturation of the soil, allowing for even the healthiest of roots to have a weaker hold. Fortunately, there are ways to help prepare your trees for the season. Prune your trees annually, even the less mature, by professionals who understand the importance of healthy tree structure. 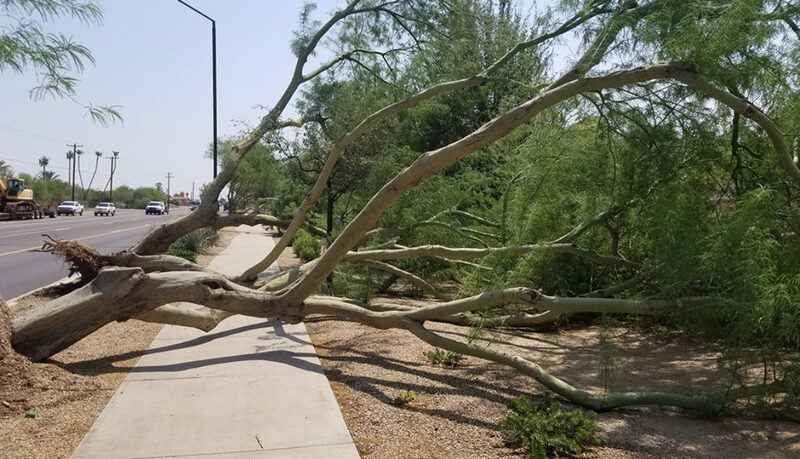 Poorly pruned trees are susceptible to disease, allowing for snapping limbs and trunks in the high winds of the monsoon season. 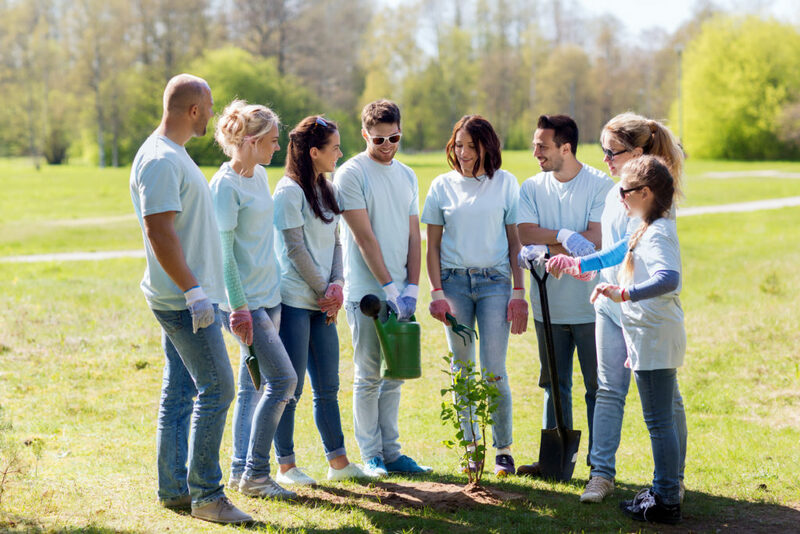 Water, mulch, and fertilize your trees regularly as healthy well-nourished trees will withstand the conditions much better than an unhealthy tree. Keeping trees thin is essential to storm-proofing to the best of your ability. 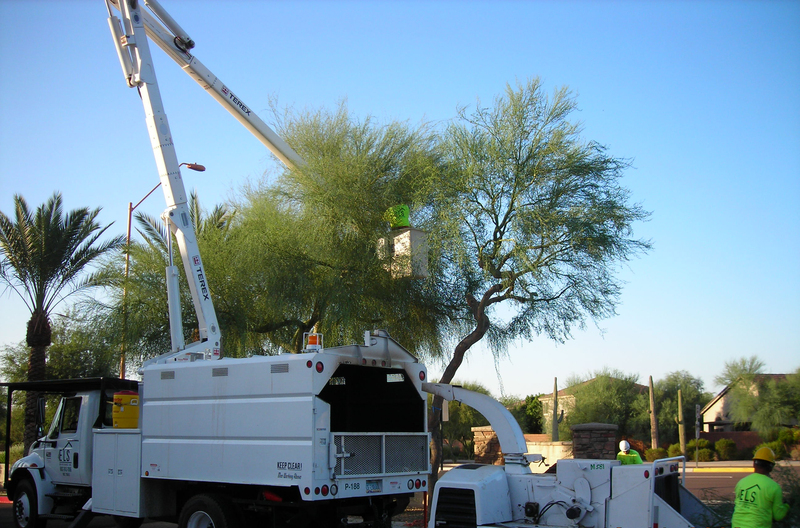 There is no way to control mother nature, but you can take steps to minimize her damage during our desert monsoon season. Properties around the valley are currently experiencing a heavy infestation of Aphids on their plants and trees in their communities. 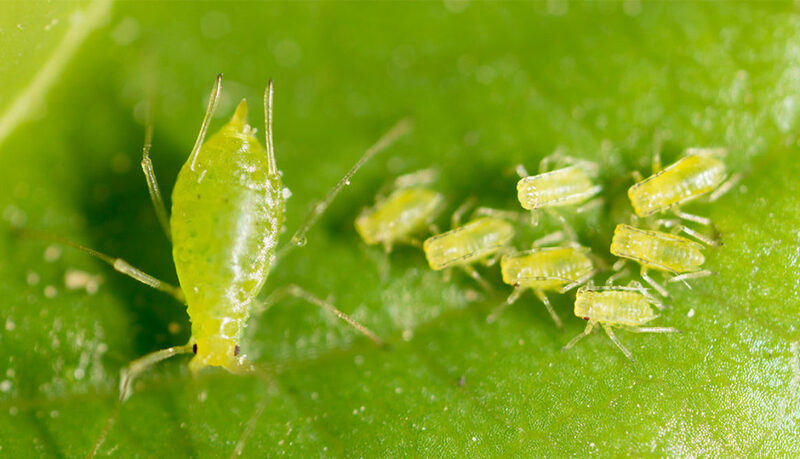 Aphids are a small soft-bodied insect that can vary in size and color. They act as a plant parasite, sucking the nutritious sap from flowers, leaves, stems, and sometimes even roots, robbing the plant of water and essential nutrients. The first sign your property may have aphids is a colorless and sticky substance on leaves below where they are feeding. The substance that is excreted from the insect are sugars from the plant host that can start to show up on grasses, leaves, even your car – basically anything underneath the insect. Due to the aphid activity on ornamental trees, it seems the plant health of the trees are declining, resulting in yellowing, wilting, leaf curl, and stunted plant growth. Although aphids are usually not harmful in moderate outbreaks, we are seeing a heavy infestation on the properties and their surrounding areas, which can lead to harmful consequences such as virus transmission and decay. Although plant fatality is uncommon due to an aphid outbreak, it is still a possibility. However, there are numerous natural ways to help manage the severity of the outbreak. 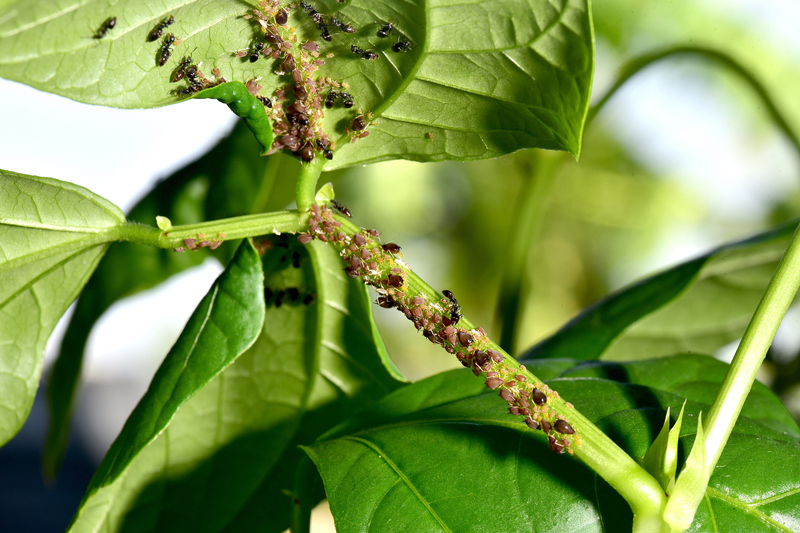 Check your plants regularly for aphids – by monitoring your plants at least twice a week it is possible to catch the infestation early so that you can prune them out or knock or hose them off. The release of natural enemies – there are several predators that feed on aphids including lacewing larvae, soldier beetles, syrphid fly larvae, and the most well-known lady beetle adults and larvae. Ant management – ants are known protectors of aphids as they are a great food source for them. If you come across ants crawling up aphid-infested trees or plants, apply a band of sticky material, such as tanglefoot, around the trunk to prevent them from crawling up.